We arrived at Seattle in the morning on Saturday. Our first stop was at Pike Place Market where the original Starbucks is at. There were so many bakeries and cafes along the street. We also saw the Space Needle and the EMP Museum. The weather was cold and it sprinkled on and off. I heard that the sun rarely comes out. As you can see, the sky was full of clouds. In downtown Seattle, the buildings have a vintage flare to them and are filled with small businesses. 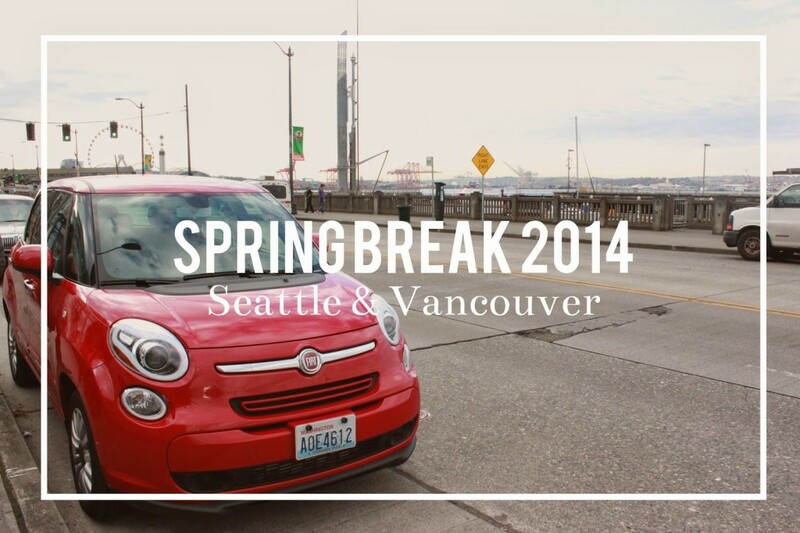 On Sunday, we drove our red Fiat to Canada. We journeyed on to Vancouver. There, we visited Granville Island, which was filled with mini shops, and Stanley Park. Some scenes from the movie Twilight were shot at Stanley Park. There were tall trees, lush green grass, and a beach. Downtown Vancouver is beautiful as well. The streets are clean, unlike San Francisco and Seattle. However, it’s hard to find parking. Just like Seattle, there are bakeries left and right. Oh, and Starbucks too. On Monday morning, we walked from our hotel to the Vancouver Convention Center where the 2010 Winter Olympics was hosted. The Olympic Cauldron was awesome. I wish that they had lit it up. The outside of it has an icy looking texture. Whenever I think of Downtown Vancouver, I think of the color blue. The harbor is right next to the towering skyscrapers with blue windows, and the sky is so clear. Thank God for the beautiful weather, because it was supposed to be raining during our stay in Vancouver. Afterwards, we made our way to the Capilano Suspension Bridge, the world’s longest suspension foot bridge. The bridge swayed as we walked across it. Below the bridge is a river, I believe. Another attraction at this site is the Cliff Walk. You’re walking high above the ground, not on a bridge, but on a very narrow walkway. Next stop was at Grouse Mountain, not too far from the Capilano Bridge. We had to take a gondola to the top of the mountain. I have to say, we were very high, about 4000 feet above the ground! The view of Vancouver was perfect. At the top, we were greeted by SNOW!! Of course, I had to say, “Do you want to build a snowman?” My brother and I went iceskating. Then, we ate lunch at their restaurant- Altitudes. We ordered a HUGE plate of nachos and a delicious plate of BBQ chicken wings. My family couldn’t even finish half of the nachos despite how hungry we were. Following Grouse Mountain, we traveled back to Seattle. On Tuesday, our last day, we visited the pier before returning our rental car at 12PM. We purchased souvenirs. My mom and I ordered some of the best calamari I’ve ever tried and my dad and brother bought some hot dog. My dad and I have started to collect stickers of the places we’ve traveled to for our luggages. Too bad we didn’t start this before. At last, our trip came to an end. Rain greeted us back in the Bay Area. I thank God for blessing us with an adventurous and safe trip. I hope you liked the photos. What have you done during your Spring Break? I’d love to know!